From floor-to-ceiling glass walls in “sky homes” to sweeping landscapes, butlers, panoramic views, yacht club concierges, waterfront settings, furniture that has yet to hit the market and private everything – including chefs, dining rooms and a boat club – the area’s most exclusive residential listings offer buyers a taste of the good life. Priced in the eight-digit neighborhood, these homes’ distinctive flair and opulence place them among the top-tier luxury offerings for buyers seeking the best in Miami-Dade high-end real estate. “This is as close to the epitome of luxury that one might find in the local market,” said Esslinger Wooten Maxwell Realtors Senior Vice President Audrey Ross. Her $18 million listing in Gables Estate is a blue-tiled-roof mansion on a 2-acre site with an observatory, photography dark room, watch-making lab, private staff quarters, nanny suite, home theater and 1,000 linear feet of seawall. A few miles away, for an asking price of $21.5 million, the Grove at Grand Bay is offering its south tower’s penthouse – 10,100 square feet indoors plus wraparound and rooftop terraces with a pool deck that add 3,600 square feet of outdoor living space. And buyers today are different from those in the market just two years earlier, said Barbara Hagen, a realtor associate with Majestic Properties and member of the Master Brokers Forum. “People who are looking are realistic people who want something special,” she said. Instead of tightfisted shoppers, today’s buyers have refined tastes and the financial resources to match. 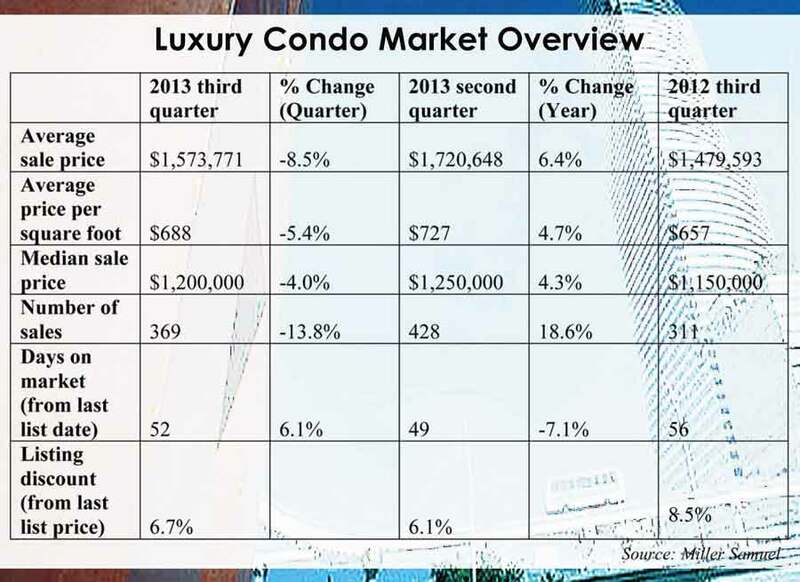 That’s why prices are trending upward for luxury real estate, market watchers say. Median sale prices for top-tier condos rose 4.3% in the third quarter of this year to $1.2 million, while single-family properties saw a 15.6% hike to $1.5 million, according to data from the Douglas Elliman Real Estate quarterly survey prepared by Miller Samuel. But developers say it takes a unique product to appeal to this market. At the DevStar Group’s latest project, a private boat club offers residents a hassle-free alternative to boat ownership. This month the company launched a south tower at Marina Palms Yacht Club & Residences, a development with a 112 wet-slip marina whose club will put 26- to 37-foot boats at members’ beck and call. With staff onsite to arrange anything from kayak outings to safety training, refueling and fully-stock refrigerators, the goal is to offer the pleasures of boating without the labor of boat ownership – all within the North Miami Beach residential development. And space was a consideration when developing the 468 condos in the two 25-story towers that will make up Marina Palms Yacht Club & Residences. With an average size of 2,200 square feet, DevStar is positioning its condos against many in Brickell, where limited land often translates to smaller units. From its grand lobby, high ceilings, large club room, living rooms built for entertaining and great rooms that spill out into deep balconies, the idea is that spacious equals luxurious. And convenience is key, too, with a news café, teen room and a fitness center with spa features. Essential too are the finishes including Grohe plumbing fixtures and Snaidero Italian cabinets that won’t come to market for another two years, thanks to a deal with the designer. But if they find the right property, high-end buyers often spend lavishly to decorate it to their taste. “People spend $2 million to $3 million to decorate a 4,000-square-foot apartment,” said Steven G, president and owner of Interiors by Steven G, a business whose latest clients include the St. Regis Bal Harbour Resort, the W hotel, Dolce Vita on Singer Island and Privé, a development on a private 8-acre island between Williams Island and Sunny Isles Beach. With private jets and resources to glam up newly acquired multimillion-dollar homes, these buyers are setting record sales prices, closing deals realtors only dreamed of a decade ago.